Brawny® Pick-A-Size® Paper Towels. 25 Feet more than the leading national brand. The strength to take on tough messes®. 6 Rolls / 84 sheets. 6 Large rolls = 8 Browny regular rolls. 94 2-Ply sheets per roll. 258.5 sq ft (24 m2). 11 in X 6 in (27.9 cm X 15.2 cm). Since 1974, the Brawny® brand has been an American icon of strength and durability. It is the original, big, tough towel. Made to be gentle. But engineered to handle the tough messes life can dish out. Giving you the confidence to accept all challenges. Allowing you to meet the worst moments with your best self. So, stay strong. Stay resilient. Stay Giant®. U.S. Patent Des. 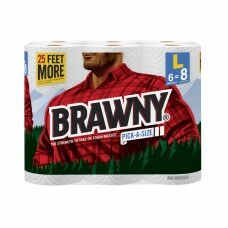 502,004 Brawny, Brawny Man Image, Pick-A-Size, Stay Giant, The Strength to Take On Tough Messes and the Georgia-Pacific logo are trademarks owned by or licensed to Georgia-Pacific Consumer Products LP. All rights reserved. Visit our website at: www.brawny.com. ©2015-2017 Georgia-Pacific Consumer Products LP.